It is normal to have problems from time to time. Dogs are living in our world and sometimes for many reasons they don't cope with it and react how dogs do which isn't always acceptable to us. Some problems can be helped with some basic training and management and others can take a very long time and lots of effort to improve. · Excessive barking in the house, garden or car. · Aggressive behaviour towards people or other dogs. · Obsessive behaviour such as fly catching, tail chasing, licking and chewing. · Lunging and barking at traffic. The consultation involves detailed questions about the problem and filling in a questionnaire. This usually reveals the cause of the behaviour which means we can get started on improving things for you and your dog. After that we look at what training we are going to do and what management we need to use and what is practical for you personally to be able to do. The consultation always includes some practical training so you know how to proceed before I leave you and have things to practice that I have seen you do and know you know how to do it. You get notes to remind you of what we did and how to do it. Follow up appointment for practical training and progression is stronger advised. Support is ongoing by email and telephone for the life of the dog. Further sessions are at a reduced price from the initial one. My qualifications are an Advanced Diploma in Canine Behaviour Management (distinction), a Diploma in Canine Behaviour and Psychology (distinction),IABTC certificate 'introduction to canine behaviour modification" theory and practical (distinction), certificate of attendance of Canine reactivity involving theory and practical, KCAI (cd)this is a qualification in companion dog training it is relevant as raising the level of the dogs basic obedience helps with behavioural problems. 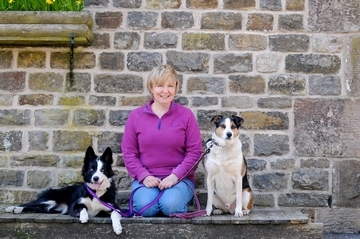 I have years of experience including seeing dogs going through different life stages in my classes and helping my own rescue collie though a whole chapter of difficulties. My interest in Canine Behavioural problems began when unfortunately my own dog was badly attacked by two bigger dogs that were off the lead and the effect on and I was profound. He because unable to cope with loose dogs near him after that and would panic and my legs would turn to jelly. I worked hard with him and it was two steps forward and one back for a long time because other people don't understand and let their dogs run up to him when he was on the lead (I'm sure some of you can relate to that!). Eventually with care I was able to start training classes and courses again with him and go to dog shows and agility. My prices are fair and it is an investment in your dog. Don't leave it until it gets so bad you can't cope. Basic price is £90 for the first consultation and £35.00 a session lasting about one hour after that. Travel expenses may be added depending if I need to travel over ten miles from Oakamoor. Hall hire charges will apply if we hire a hall. I cover Staffordshire, Derbyshire and Cheshire.